After 6 months of searching and interviews, Jeff Bridgforth joined our team in January. 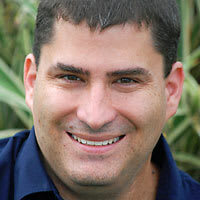 He came to us from Bonnier, where he built websites for Popular Science , Popular Photography , Saveur , and Parenting . He and his family relocated to Chattanooga from Orlando over the summer and they've settled in nicely. In March we bought an office in Chattanooga’s Southside neighborhood and the renovation of the space was a project and a half. We did the CAD drawings, lighting and electrical diagrams, interior design, and such—pretty much everything but the build-out (many thanks to Haskel Sears & team for their skills in that area). We've settled in and think the results are pretty awesome. 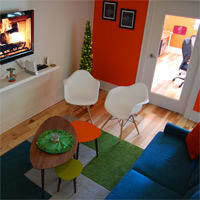 I got to stretch her design legs on this project, picking out the colors, furniture, rugs, and flooring. I’ll be posting details chronicling the process on our blog in the coming year, so if you’re into mid-century modern design, keep an eye out for those. 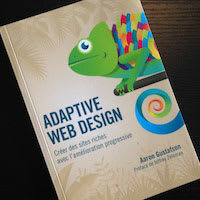 In May, almost 2 years to the day after it’s original launch, Aaron's book Adaptive Web Design was released in France by Pearson. Incroyable! In August we launched a new talk series called Code & Creativity. The free, bimonthly series features two speakers, one from Chattanooga and one from elsewhere. We started the series to create a casual venue to bring Chattanooga’s diverse design and development community together, celebrate local talent, and provide access to amazing presenters. The response has been phenomenal and we are quite thankful for the amazing speakers we’ve had so far: Nicholas Zakas, Jason Griffey, Jenn Lukas, Daniel Ryan, Kate Kiefer Lee, and Nate Hill. We’ve already begun booking our 2014 dates and the line-up looks to be impressive. Check out codeandcreativity.com for more information. And finally, we've opened up a portion of our new office to house the Chattanooga Open Device Lab. 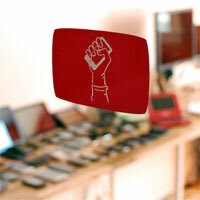 The CHA-ODL is a community resource that is freely available to area designers and developers working on the web or developing apps. We currently house over 40 different devices ranging from feature phones and smartphones to gaming systems, laptops, and tablets. We’re very excited to be able to share the resources we have to help others in the community, and look forward to seeing how the lab grows. We're offering regular hours starting in 2014. If you're interested in booking some time in the lab, visit chadevicelab.org. As you can see, it’s been a whirlwind of a year for us and we’re very thankful for the support of our clients and community that has helped us to grow and empowered us to continue giving back to the design & web community. We wish you and yours a wonderful holiday season, and we hope to spend some time with you in the new year!